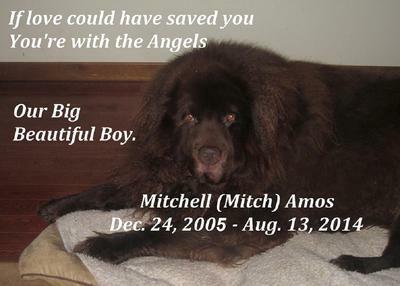 Our Beautiful, big, #220 Bronze Newfie, Mitch (Mitchell) was our heart. We adopted him at 7 weeks old. A Big red, ball of fluff! We are grandparents and everybody asked us what we were thinking, taking on such a big animal? But everything about him was so easy. He immediately went outside, we never had to paper train him. Wherever we took him people would stop and ask what he was. Completely bronze, reddish brown, no white at all and simply gorgeous! And super loving and gentle. We never worried when people asked if they could pet him, he lapped up attention. I'd talk to him and he'd talk back. And he'd start, with his deep, loud bark. Then it got to the point that he initiated the talk/bark sessions, he'd start with a low, throaty sound and we knew, he wanted to talk, most of the time with his head on my lap. Other times our big brute would literally whistle like a bird! We'd often wondered what the neighbours would think. So we bought a farm, he needed room to roam, he was growing so fast. True story - In the city we would walk him in the park across from us, Mitch now weighed almost #220 and all that red fur. We started getting friend calling and asking if we read the paper. Some one had reported seeing a Bear loose in the park. In August he past from our lives and life has changed so drastically, it's terrible. We know this too will pass, but there will never be anything like Mitch, in our lives, again. Thank you for telling us about Mitch and for giving him his own page on my website. I know what it is like to lose one of these beautiful and loving creatures. I believe my Joshua will be waiting for me when I get to Heaven. Your story about someone reporting a bear loose reminded me of an article in the local paper in Dartmoor. Someone took a photograph and sent it in to the newspaper, saying he had captured an image of the beast of the moor, supposedly an escaped black panther. Another lady wrote to the paper: That's not the beast of the moor, that's my Newfoundland! Take care, and God bless.